Home | Michael F. Weisberg, M.D. What happens when you are admitted to the hospital as a patient, and the physician assigned to be your doctor has never seen you before and knows absolutely nothing about you? Welcome to Medicine in the 21st century, where the results of having a Hospitalist instead of your own doctor can be disastrous. Specialist Dr. Aaron Bernstein enters the world of the Hospitalist firsthand when he confronts a schizophrenic patient who – literally – is a ticking time-bomb. Watch Dr. Weisberg share his thoughts and experiences about the inspiration behind The Hospitalist. "The Hospitalist is a terrifying tale that takes readers deep inside the modern healthcare system, exposing the economic and professional forces destroying the ability of doctors to do their jobs. 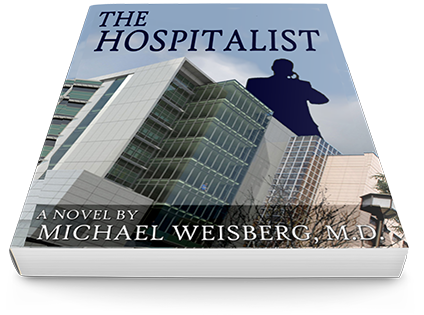 Michael Weisberg, a renowned physician for more than two decades, penetrates the thick walls of hospitals, doctors’ offices, law firms and insurance companies, exposing realities that have remained secret for too long. In the process, Weisberg lays bare the arrogance, aspirations, greed and foolishness tearing apart the quality of patient care. Anyone seeking treatment in a hospital must first read this book. " Although The Hospitalist is fiction, its premise and tension offers much food for thought about the modern healthcare system as it combines a social commentary with insights on how doctors become thwarted by medical systems. Diagnostic challenges, a schizophrenic patient who is only one of a number of ticking time bombs, the rigors of being an overworked gastroenterologist, and doctors who never really take care of patients are all powerfully presented in a medical novel that satirizes medical practices, insurance processes, dreams corrupted by the medical field, and more. One of the unexpected pleasures in The Hospitalist is that its back cover blurb suggests a Robin Cook-style thriller and medical mystery; yet readers who enter the story anticipating action and entertainment will instead find the action takes place on a different level than a thriller usually offers, with the entertainment quickly turning into a social inspection of the medical system and how physicians and patients navigate its complex corridors. There's suspense, humor, numerous characters and special interest groups, pointed commentary, and powerful reflections on work, ethics, and choice throughout the story line. As Aaron faces the temptation to return to being a healer without all the financial and political pressures of being a physician, he asks and faces some hard questions about doctors, patients, and their regulated environments. Anyone with an interest in the medical community will find The Hospitalist a different kind of read that doesn't dilute its impact with casual tension, but probes for the deeper cancer at the heart of organizational processes. By choosing a fictional format, The Hospitalist makes far more of an impact in exploring these various pressures and the real-world special interests affecting a wide range of doctors, patients, and those who interact with them. Dr. Michael Weisberg has practiced gastroenterology in Plano, Texas for 24 years. He has been named D Magazine’s list of best doctors eight times and has been recognized as Super-Doctor by Texas Monthly multiple times. © 2019 Michael F. Weisberg, M.D.